At our last meeting we decided to undertake various fundraising and maintenance measures in addition to the development of our positive forward community plan. 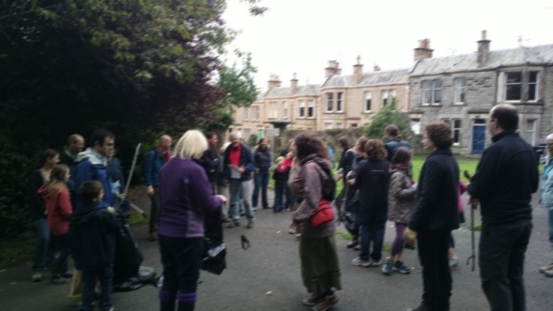 So on a brisk Oct Sunday morning, nearly 40 members of the local community turned out to clear up the Craighouse site. 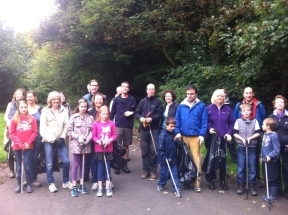 The event was arranged under the umbrella of the Craiglockhart Woods Group who cover the Lockharton end and the LNR. Our combined efforts meant the whole site got a spring clean – with our volunteers clearing Craighouse campus site – concentrating on Craighouse orchard, meadow and surrounding woodland. We had decided to keep the pick relatively low-profile as we had limited numbers of litter picking tools. However, the site is large so we didn’t want to have too few volunteers either! In the end, it couldn’t have gone better – approximately 37 people turned out to clean up the site – including families with children, the odd dog and even a baby (taking more of an observational role). 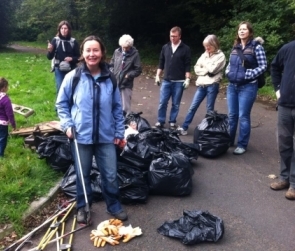 Armed with litter-pickers and thick gloves our intrepid volunteers spent about an hour clearing up the site. And they collected a LOT of litter. Members of the local community have been regularly clearing litter off the meadow area and the site has been looking much improved as a result. However there was still much litter to be shifted once we went into the woodland and a tremendous number of black rubbish bags were filled – plus we collected various bits of bigger rubbish that wasn’t baggable. All was brought down to the bin at Craiglea Place. Usually, the Woods Group are able to leave their bags next to the bin at Lockharton where the Council picks it up in a few days. But our members had managed to collect so much that the colossal pile of rubbish presented a bit more of a problem. Loadsarubbish! Photo courtesy of Tana. We piled it at Craiglea but decided that a couple of us better take what we could to the tip, so I returned later that afternoon with a car and loaded it up. I had filled up the car and was looking at the horrible amount still left when a bin van rolled up. Three guys got out – the Craigmillar Depot Team. Although it wasn’t their job once they heard it was a community litter-pick they were absolutely brilliant and helped me out by taking the lot! So here’s a big shout out to them. I will be writing in to the Council with a big thank you to the Craigmillar Depot Team to let people know what a lovely bunch of public-spirited guys they are. All in all – a really good and productive day. A huge thank you to everyone involved – thank you to the wonderful volunteers for kindly giving their time on a Sunday morning, the Woods Group for organising the pickers and gloves and bags and all the other administration they did, the Council’s Ranger Service for providing the tools, the lovely Craigmillar Depot Team for saving me a very long afternoon going back and forth to the tip and Anni and Hilda for doing the bulk of the organising. The site is looking so much better – and that’s down to the community clearing it every day and now those giving their Sun morn to litter-pick. What a pity the site owners have thought to remove the benches from the meadow area. I am sure all the hard working publicly spirited folks could have done with a rest on a seat with a view after doing such a good job and making such a difference for the benefit of us all. Thanks Lizzie – couldn’t agree more! The benches are a big loss – especially to those who are elderly and enjoy sitting and looking at the view or need a rest halfway up the hill. The whole community loved them – many were donated by the community.